You are curenlty in Alimed Grand Line® Quad Walking Cane, With Wheels, Left, 600 Lb Capacity, Black made by Alimed and asigned to category. Walking Cane Legs Work With Wheels And Act As A Brake When The Cane Goes Out In Front Of The User. The Farther The Cane Is In Front Of The User, The More Weight Is Placed On The Legs. 5" Wheels Make It Easier To Roll Over Imperfections In Surface. Dimensions: 13-1/2" X 29-1/4" To 39-1/4"
You have selected Alimed Grand Line® Quad Walking Cane, With Wheels, Left, 600 Lb Capacity, Black from Ambulatory Aids. We hope that this Alimed Grand Line® Quad Walking Cane, With Wheels, Left, 600 Lb Capacity, Black made by Alimed is what you were looking for. 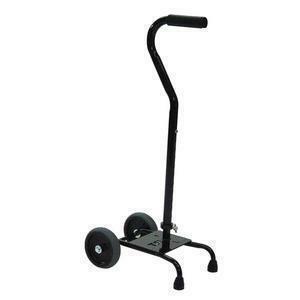 If you have any questions about this particular Alimed Grand Line® Quad Walking Cane, With Wheels, Left, 600 Lb Capacity, Black or any other products from Ambulatory Aids, please call us. We have an experienced staff that will gladly help pick out the correct Alimed Grand Line® Quad Walking Cane, With Wheels, Left, 600 Lb Capacity, Black for you, also. If you are looking to make a purchase of Alimed Grand Line® Quad Walking Cane, With Wheels, Left, 600 Lb Capacity, Black in large quantity or you are a Hospital or Medical facility and need help on making a purchase of Alimed Grand Line® Quad Walking Cane, With Wheels, Left, 600 Lb Capacity, Black made by Alimed, please contact us.